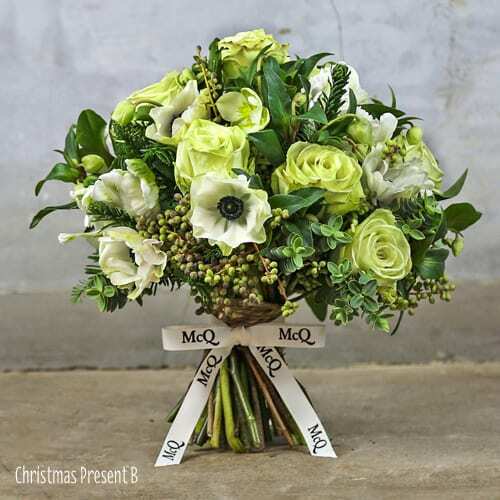 Today, I’m delighted to share with you a collection of six beautiful Christmas bouquets from London florist, McQueens. They’re themed Christmas Past, Christmas Present and Christmas Future. 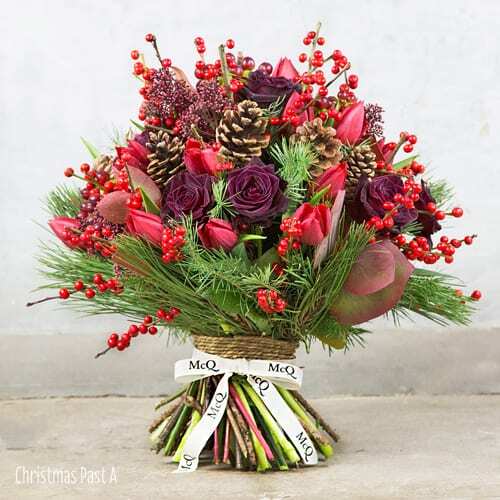 Christmas Past A…Deep claret roses, pine cones, Ilex berries and just a hint of red tulips make up this wonderful winter arrangement. 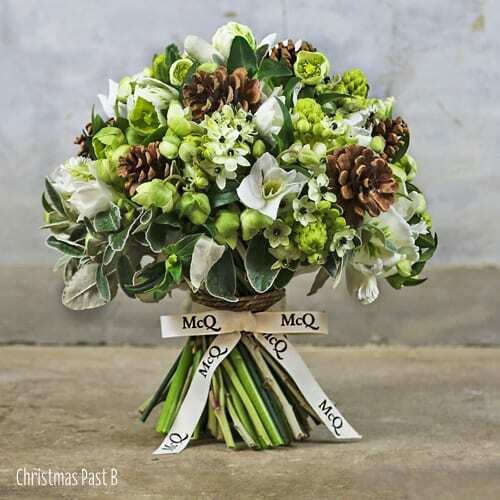 Christmas Past B…A classic white combination of Ornithogalum arabicum, Eucharist lilies, seasonal flowers and pine cones. 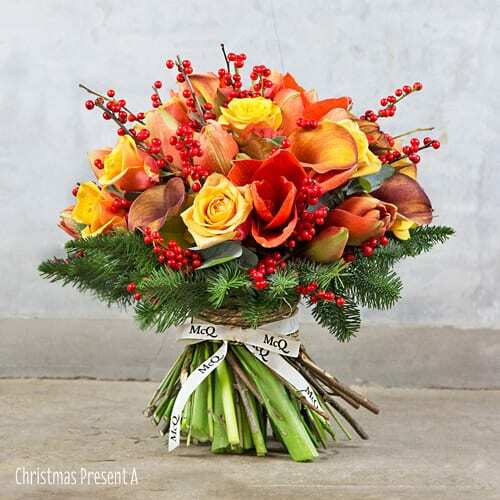 Christmas Present A…Crackling with all the warmth and welcome of the festivities ahead, this fiery bouquet includes red Amaryllis, clusters of Ilex berries, roses and Calla lilies. Christmas Present B…Beautiful white blooms including anemones and roses, plus seasonal flowers are featured in this textural design. 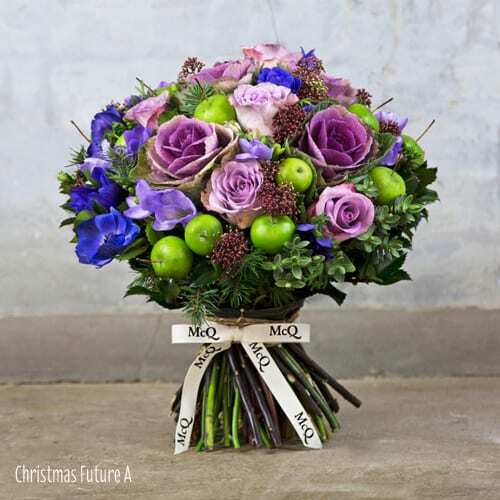 Christmas Future A…Brassica, dusky lilac roses and deep violet anemones are combined with tiny green apples for an innovative twist. 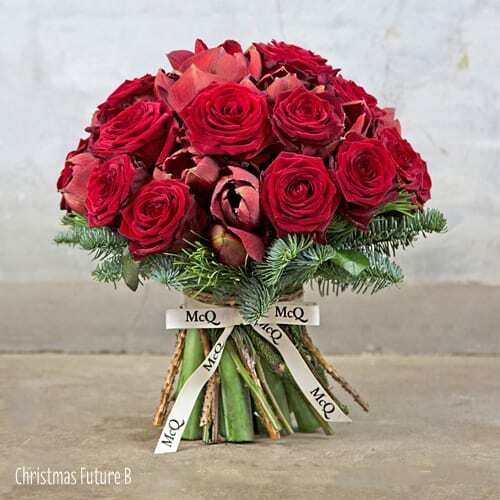 Christmas Future B…Exuding all the warmth of the yuletide season, the rich red of these Naomi roses and Amaryllis, with sprigs of fragrant spruce, look just the part for Christmas. Aren’t all the bouquets just wonderful? They’re available from McQueens stores and for delivery within the London area. Wouldn’t they be perfect to send to flower-loving family and friends as Christmas presents? To see their whole collection, please do visit the McQueens website. P.S. Did you know that McQueens are on Instagram?